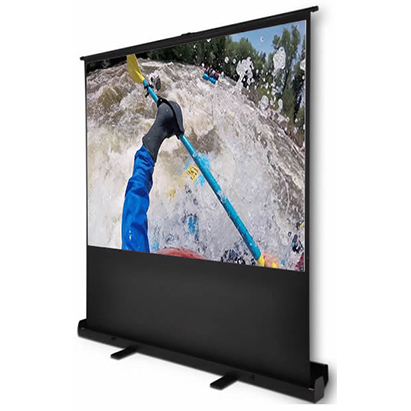 The Esquire Electric Projector screen 300 x 300 series also known as a Motorised Projector screen is ideal when heavy demands are placed on the projection screen. The screen can be operated comfortably by using the remote control or from a wall-mounted control box. The screen is suitable for wall and ceiling installation. The power cable is on the left hand side (from front of screen). The fabric is suitable for both LCD and DLP projectors and allows a wide viewing angle. The screens has a black back, impervious to light penetration and will allow it to be positioned in front of a window. The black border and black drop improve the contrast and clarity of the picture and the flatness of the screen. It is suitable for conference rooms presentations with high-end equipment, it also produces excellent results in a home cinema environment and classroom training with a gain factor of 1.2.Bundled with a wireless remote control, you can open or close the screen with a touch of a button, Professionalism Personified! The Esquire PLV180 Scena Pull-Up Floor standing Projector Screen 1.8m x 1.35m (90 inches)- Standard 4:3 Video Format provides a perfect platform to create your very own Home Theatre Experience or Business Presentation Screenings. 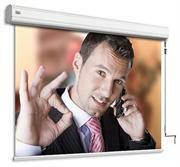 It is also ideal for PC-based presentations and general purpose video use in a small room. The PVC Matte White screen offers a gain factor of 1.2 (Low light Reflection Rating) making this suitable for LED, LCD and DLP projectors. The high-quality screen offers an aspect ratio of 4:3 for Video Format screen viewing. 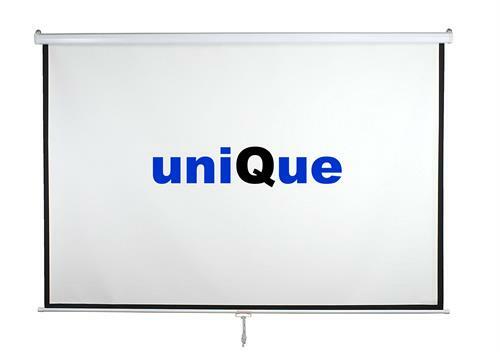 •Ideal for home theatre movies, classroom training, conference room presentations, public display, etc. 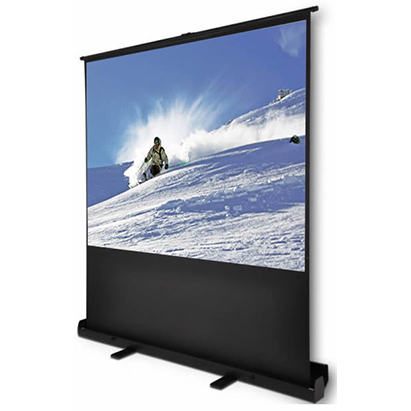 The Esquire electric projector screens 300 x 300 series also known as motorised projector screens is ideal when heavy demands are placed on the projection screen. 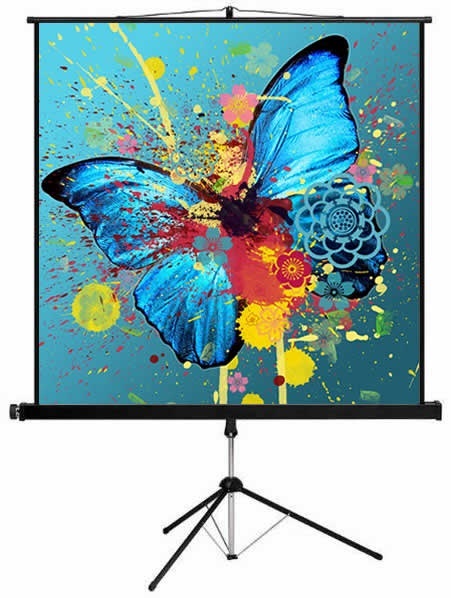 This projector screens is made from a high quality screen fabric that creates a smooth surface for superior image quality that is suitable for both LCD and DLP projectors and allows a wide viewing angle. It is suitable for conference rooms presentations with high-end equipment, it also produces excellent results in a home cinema environment and classroom training with a gain factor of 1.2. The black back ensures that no light is lost and the projection is clear. The black border surround ensures increased contrast and improves the flatness of the fabric. 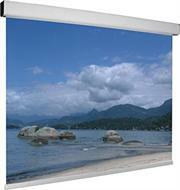 The screen is ideal for wall or ceiling mounting. The Esquire PLW180 Scena Pull Up Floor standing Projector Screen 1.8m X 1.02m (81 inches)Wide Screen 16:9 format is an interesting mobile solution and a perfect platform to create your very own Home Theatre Experience or Business Presentation Screenings. It is also ideal for PC-based presentations and general purpose video use in a small room. The PVC Matte White screen offers a gain factor of 1.2 (Low light Reflection Rating) making this suitable for LED, LCD and DLP projectors. The high-quality screen offers an aspect ratio of 16:9 for wide screen viewing. The Esquire PLV160 Scena Pull-Up Floor standing Projector Screen 1.6m x 1.2m (80 inches)- Standard 4:3 Video Format provides a perfect platform to create your very own Home Theatre Experience or Business Presentation Screenings. 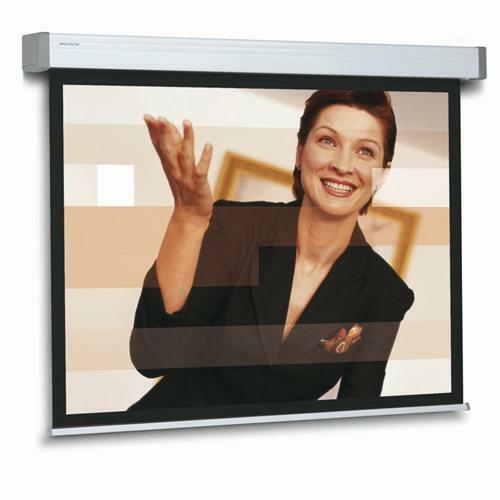 It is also ideal for PC-based presentations and general purpose video use in a small room. The PVC Matte White screen offers a gain factor of 1.2 (Low light Reflection Rating) making this suitable for LED, LCD and DLP projectors. The high-quality screen offers an aspect ratio of 4:3 for Video Format screen viewing. The Esquire PLW160 Scena Pull Up Floor standing Projector Screen 1.6m X .0.9m (72 inches)Wide Screen 16:9 format is an interesting mobile solution and a perfect platform to create your very own Home Theatre Experience or Business Presentation Screenings. It is also ideal for PC-based presentations and general purpose video use in a small room. The PVC Matte White screen offers a gain factor of 1.2 (Low light Reflection Rating) making this suitable for LED, LCD and DLP projectors. The high-quality screen offers an aspect ratio of 16:9 for wide screen viewing. 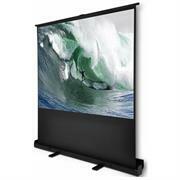 The Esquire PLV120 Scena Pull-Up Floor standing Projector Screen 1,2m x 0.9m (60 inches)- Standard 4:3 Video Format provides a perfect platform to create your very own Home Theatre Experience or Business Presentation Screenings. 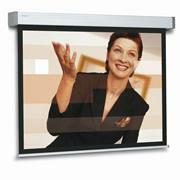 It is also ideal for PC-based presentations and general purpose video use in a small room. The PVC Matte White screen offers a gain factor of 1.2 (Low light Reflection Rating) making this suitable for LED, LCD and DLP projectors. The high-quality screen offers an aspect ratio of 4:3 for Video Format Screen viewing. 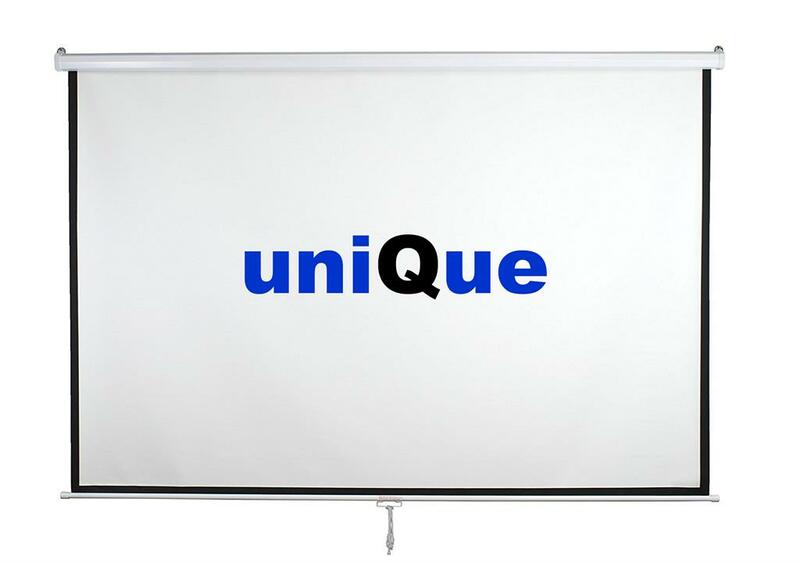 The Esquire Manual Projector Screen 300 X 300 manual series is a high quality and robust manual screen that is operated using a spring mechanism for use with any projector system. This unit is suitable for conference rooms with high-end equipment. It also produces excellent results in a home cinema environment. The thick and heavy fabric improves the flatness of the screen.The high-quality adjustment mechanism enables settings at different formats and makes the screen suitable for different aspect ratios: from 1:1, 4:3, 16:9 The screen has a gain factor of 1.0 suitable for both LCD and DLP projectors. This provides complete flexibility. The black back ensures that no light is lost and the projection is clear.The screen is ideal for wall or ceiling mounting. 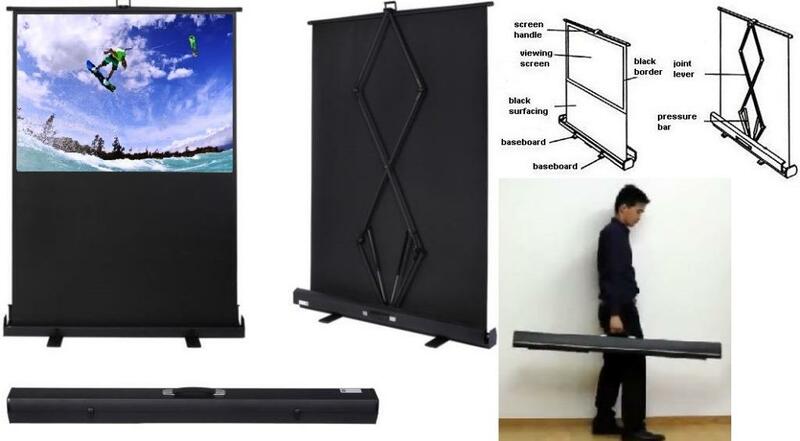 The Esquire PLW120 Scena Pull Up Floor standing Projector Screen 1.2m X .0.68m (54 inches)Wide Screen 16:9 format is an interesting mobile solution and a perfect platform to create your very own Home Theatre Experience or Business Presentation Screenings. It is also ideal for PC-based presentations and general purpose video use in a small room. The PVC Matte White screen offers a gain factor of 1.2 (Low light Reflection Rating) making this suitable for LED, LCD and DLP projectors. The high-quality screen offers an aspect ratio of 16:9 for wide screen viewing. 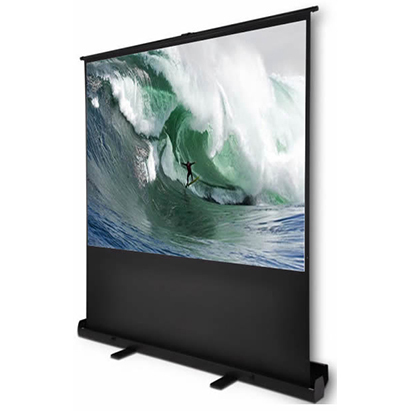 The Esquire electric projector screen 180 x 180 series also known as a motorised projector screen is ideal when heavy demands are placed on the projection screen. The screen can be operated comfortably by the wall-mounted control box that guarantees a perfectly flat-hanging screen that is adjustable to different formats and makes the screen suitable for different aspect ratios: from 1:1, 4:3, 16:9. Bundled with a wireless remote control, you can open or close the screen with a touch of a button, Professionalism Personified! • Comes with control box (wall mounted). 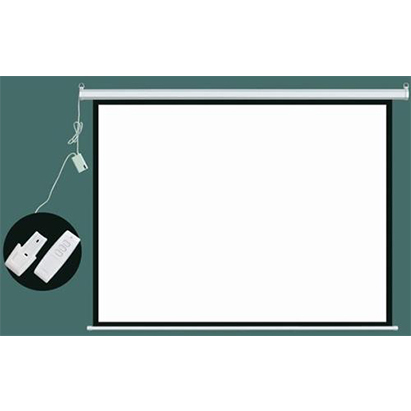 The Esquire Manual Projector Screen 300 X 169 series is a high quality and robust manual screen that is operated using a spring mechanism for use with any projector system. This unit is suitable for conference rooms with high-end equipment. It also produces excellent results in a home cinema environment. The thick and heavy fabric improves the flatness of the screen. The high-quality adjustment mechanism enables settings at different formats and makes the screen suitable for different aspect ratios: from 1:1, 4:3, 16:9 to 21:9. 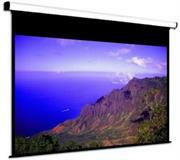 The screen has a gain factor of 1.2 suitable for both LCD and DLP projectors. This provides complete flexibility. The black back ensures that no light is lost and the projection is clear. The screen is ideal for wall or ceiling mounting. 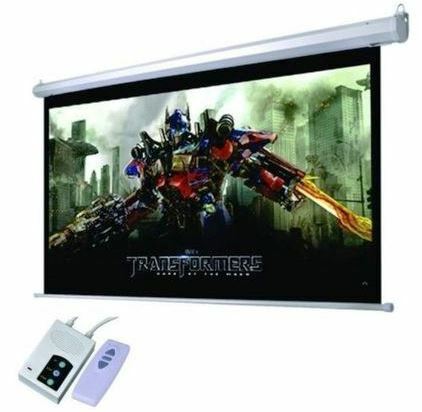 The Esquire electric projector screens 180 x 180 series also known as motorised projector screens is ideal when heavy demands are placed on the projection screen. - Comes with control box (wall mounted). Esquire CSW200 Cinema Series (200x113)16:9 HDTV format -This lightweight, yet durable Tripod Projection Screen is designed for Home Entertainment "Home Theatre in a Box" for a big screen viewing experience, other uses are portable presentations, Audio-visual use for your business and even educational needs. It features a durable flame retardant and mildew resistant screen material with superior reflectivity and a matte white surface, rolled into a rugged metal case. 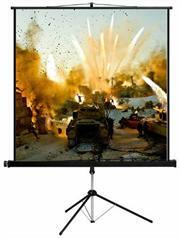 The tripod projector screen is easy to set up and taken down . Literally take the tripod screen out of the box , pull the legs out, turn the screen from the vertical to horizontal and pull the screen out of the metal case to your required height to any level on the tripod upright and vice versa. •Steel tripod stands ensure the stability of the screen. •Viewable H/W/ D : 80"*45"/ 90"
Viewable Reference size to Inch WxH / Diagonal 80"*45"/ 90"
Application: Home Entertainment "Home Theatre in a Box"
The Esquire CSS150 (150x150) lightweight, yet durable Tripod Projection Screen is designed specifically for Portable presentations, Audio-visual use for your business, Educational needs and even Home Entertainment . It's ideal for school classrooms, small room conferences, weddings and special events, fitting easily into tight spaces for a big screen viewing experience. It features a durable flame retardant and mildew resistant screen material with superior reflectivity and a matte white surface, rolled into a rugged metal case. The tripod projector screen is easy to set up and taken down . Literally take the tripod screen out of the box , pull the legs out, turn the screen from the vertical to horizontal and pull the screen out of the metal case to your required height to any level on the tripod upright and vice versa. 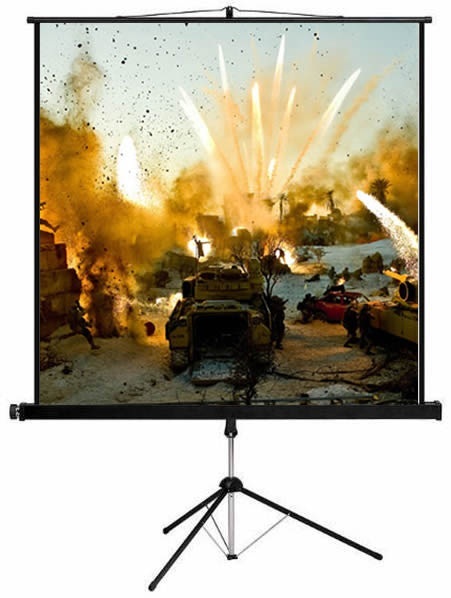 Reference size to Inch WxH / Diagonal 59""x59"
The Esquire Manual Projector Screen 180 X 180 manual series is a high quality and robust manual screen that is operated using a spring mechanism for use with any projector system. This unit is suitable for conference rooms with high-end equipment. It also produces excellent results in a home cinema environment. The thick and heavy fabric improves the flatness of the screen. The screen has a gain factor of 1.0 suitable for both LCD and DLP projectors. This provides complete flexibility. The black back ensures that no light is lost and the projection is clear. The black border surround ensures increased contrast and improves the flatness of the fabric. 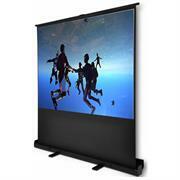 The screen is ideal for wall or ceiling mounting. This screen has been designed to be wall or ceiling mounted. The screen is housed in a white metal case and has mounting holes at either side. The screen can be wiped clean and has a black border to enhance the definition of the projected image. 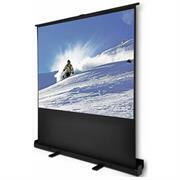 Our projector screen also features a weighted bottom bar to prevent jamming in the case and curling when in use. The screen can be pulled out to the desired level and has a spring mechanism to pull the screen back into the housing once you have finished using it.